"A [Junk] Scientist’s Misguided Crusade" Against the Keystone XL Pipeline | Watts Up With That? Last Friday, at 3:40 p.m., the State Department released its “Draft Supplemental Environmental Impact Statement” for the highly contentious Keystone XL pipeline, which Canada hopes to build to move its tar sands oil to refineries in the United States. In effect, the statement said there were no environmental impediments that would prevent President Obama from approving the pipeline. As a private citizen, Hansen, 71, has the same First Amendment rights as everyone else. He can publicly oppose the Keystone XL pipeline if he so chooses, just as he can be as politically active as he wants to be in the anti-Keystone movement, and even be arrested during protests, something he managed to do recently in front of the White House. Yet what people hear from Hansen today is not so much his science but his broad, unscientific views on, say, the evils of oil companies. Hansen should be fired and prosecuted for misusing his office and title as a NASA director in an effort to push his political agenda (the Hatch Act). The Hatch Act grew out of nineteenth-century concerns about the political activities of federal employees. As early as 1801, President Thomas Jefferson issued an Executive Order that said federal workers should neither “influence the votes of others, nor take part in the business of electioneering.” He saw such activities as “inconsistent with the spirit of the Constitution.” Jefferson was primarily concerned with what government employees did while in office; subsequently, concerns developed in another area. Throughout the nineteenth century, appointments to the federal bureaucracy were viewed as the natural spoils of political success. The prevalent awarding of jobs for political loyalty created a so-called spoils system and, ultimately, a reaction against it. Wouldn’t that be nice to see, Hansen getting the ax. It SURE is appropriate. So who is the current head of NASA ( . .sorry, being too lazy to look it up . . 🙂 ). Let’s all send that person a request for Hansen to be removed from his position. In Canada we have the problem of Dr. David Suzuki, politically active and endorsing specific candidates (and villifying others) and lobbying even foreign governments while an employee of the national news service, the CBC, which puts him on a (nature specialist) podium of “saving the planet”. Ezra Levant of Sun News (Toronto)has been going after him for this breach of clearly defined restrictions. Both Hansen and Suzuki should be forced to decide which they wish to be, a “respected” senior member of government or government services, or a political activist. Green activism is not the same as political activism and both Hansen and Suzuki have crossed the line between the two by explicitly called for specific political policies and politicians to be supported or opposed. For people who claim that money is not important to them, the dollar certainly has a sweet taste. I can understand how many scientists at NASA would be frustrated by Hansen. There are many very non political highly intelligent and respected scientists who work at NASA. Its unfortunate NASA allows Hansen to do whatever he wants. It is reflecting on the reputations of all who work at NASA and the institute itself. I’d really love to see this idiot (Hansen) fired-sooner rather than later. .
Don’t bang him up (much as I’d like that) he’d be too much of a martyr. Why are people alarmed that tar sands are “dirty”? The oil company refineries take the impurities out, and crack and distill it until it meets the specifications of the products they make from it. Also, why the worry that this could possibly get down into the aquifer. It requires heat and/or solvents to even get it to flow through a pipe. If it flows out of the pipe somewhere, the problem will more likely be a hardened mess of asphalt goo. Martin C…..according to wiki(yeah,yeah.I know),Charles Bolden, administrator.But it’s kinda cunfussing as it also list the US government. Regardless, if nothing else than ruining the good name of an outstanding puppeteer and designer,Hansen should get the ax,only probably not where most people think. The oil is flowing across the border and to ports to China in any case by train tanker car. Tanker car capacity is being built to allow an additional 2 million barrels a day to ship. I would prefer pipeline to train shipments without question. And actual like Mann he does much good work without even knowing it , and for the very people he dislikes so much . “When oil companies needed to provide safe, economical, over-land transport to bring crude oil from offshore platforms along California’s central coast to Los Angeles-area refineries, they called on the pipeline expertise of Rooney Engineering, Inc., A Tetra Tech Company (REI). We need you on the picket lines Dana. I remember Hansen a few years back on a BBC Horizon science program. He talked of being muffled. 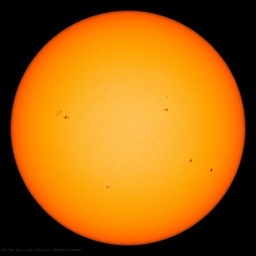 The funny thing is that I hear more from him on the MSM than any other astronomer or for that matter climate scientist. That show was frightening for me at the time. They talked of co2, runaway, methane calthrates and ended with fire coming out of the sea. No joke. Horizon should be ashamed of that episode. It was that piece of fiction that set me off looking for more evidence. We have several thousand foreign individuals in the country illegally recently released from jail and the reason they were released is because of the Sequester. Yet, this guy continues to be funded. One day, James Hansen’s grandchildren are going to look back at their grandfather and hang their heads in shame. It’s not their fault to have Bart Simpson as a grandfarter. The sooner he is fired the better it will be for the grandchildren. Federal employees, as private citizen as all the rights and privileges of citizenship. As a Federal employee some restrictions apply. If Hansen or anyone else believe they have some calling or moral obligation to speak out, while Federal employees, he or she is obligated to resign that position first. Unfortunately in our modern society few are willing to take personal responsibility for anything let alone anything that might effect income. As a so called scientists perhaps Hansen might have used bituminous sand. Tar as any child would know is a man made product. We make oil up here in Fort McMurray – if he has any doubts ask China. Moreover, on a world wide scale Canada as a nation is responsible of 0.02% of co2 on planet earth. Of that 0.02% the oil sands is responsible for 0.001% co2 on a Canada wide basis. Hardly the stuff of nightmares is it? We use 1/5 of 1% of the water flowing in the nearby Athabasca River – 85% of the water we do use is recycled year around. We have 100 water quality monitoring stations around the region and 58 air monitoring systems around the regions operating 24/7/365. The air up here is better than in any city on planet earth any day. Trust me we produce OIL. Anyone that calls it tar is an idiot. Some one should tell Hansen to relax, we Canadians are getting those sands as clean as we humanly can. We understand him to be obsessed with us having only the cleanest sand. I agree, Hansen is bad for NASA and always has been. I’m surprised he’s lasted so long. If there’s huge resentment inside NASA, then what’s the matter with them all? Why haven’t they risen up as one and kicked this no-hoper out? Are they all cowards now at NASA? I know the astronauts and engineers wrote that letter (which was brilliant) but NASA refused to act on it. I understand everyone else is worried for their pension, but they can still band together which would protect them from persecution. Now, I used to respect NASA above all else. I worshipped the space program. I tell you, though, if they keep silent and let Hansen die of old-age still with his “job” – they will never – EVER – win my respect back. I want to see heroes back at NASA and I don’t care if they are desk-jockeys. GET RID OF HANSEN. Albertalad: You didn’t mention that Hansen’s activities won’t stop Canada from producing oil, or that it is being transported to the US via truck and rail, a much more “polluting” method than pipeline. Hansen should be given his gold watch and thanked for his service, or fired and asked to reimburse the public for their money he has wasted. Wonder which will come first – Hansen being fired or the oceans boiling? He’s still employed at NASA. Which is also the proof that some people are more equal than others. The “hardest” part is torturing the data so that it gives the expected results? I guess. These things must be done delicately. . . oh yeah, that’s right, now that I hear his name . . so writing him about Hansen would be worthless . . . or less than worthless . 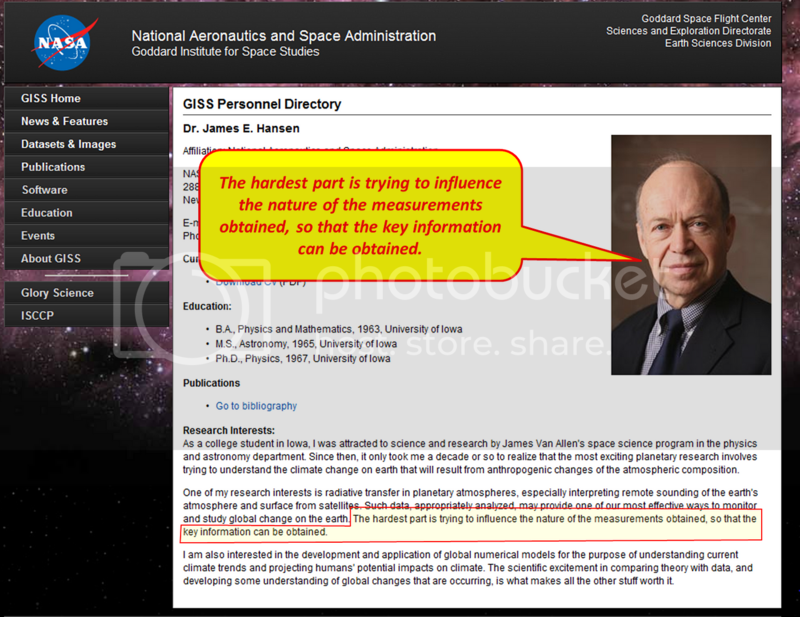 . .
Hansen’s credibility has drained all the respect I had for NASA. Just like our federal government; NASA has bloated itself to the point that it’s just another “black hole” for our tax dollars. Facts is facts, and politics is politics. But in our federal government and NASA; politics is facts. Goes to show how ignorant Hansen must be. It’s not “tar sands” – tar is a byproduct of coal. Its called the “oil sands” – he can’t even get what it is he is talking about straight. Indeed! The nature’s worst and largest environmental oil spill is being cleaned up, one shovel of sand at a time. Hansen should be lauding great praise instead of vitriol. Sorry Doug but green activism is political activism. Friends of the Earth, Greenpeace and the WWF all receive substantial (FoE Europe almost 6o% of its income) amounts of cash from the European Commission (unelected beaurocrats who dictate European policy) to lobby the European Parliament (federalist rubber-stamp of the Commissions dictates) to approve the tax-grabbing “environmental” taxes that fund the increasing beaurocacy and expansionism of the Commission. One big socialist, money sucking, economy destroying, academia entrenching, media greasing, politics corrupting, green activism merry-go-round. To paraphrase Thatcher it will only stop when they run out of other peoples money. He should be sent to the space station or be fired! Better just sent to outer space. Have fun believing that James Hansen will be fired. The way politics work in this country now is if you are advantageous to the one in power, the ones in power will always look the other way unless the media forces their hand. And since most of the media has a liberal-fetish, not enough of them will cause an outcry to cause this administration to prosecute the man. Abstract: We propose a global and mandatory heuristic that anyone involved in an action that can possibly generate harm for others, even probabilistically, should be required to be exposed to some damage, regardless of context. We link the rule to various philosophical approaches to ethics and moral luck. There are certainly very many scientists doing excellent work at NASA and keeping their political opinions to themselves. The same also applies to other organisations like the Royal Society and the AGU. The problem is that the upper echelons of these groups have been infiltrated by radical red/green environmental fanatics, who misrepresent the organisations they lead as being wholly in agreement with their distorted worldview. That’s how it’s made to look as though the majority of scientists worldwide are worried about man-made climate change, which I’m convinced is not the case. I’m sure Hansen is despised by many NASA scientists for his behaviour, and it seems clear to me he is probably violating every clause in his employment contract by using his position in the way that he has, but he’s been doing it for years now and nothing has happened to him. NASA is a government agency; it’s controlled by the present Democratic Obama administration, who also control the EPA. For this reason NASA, as an organisation, is no longer the epitome of scientific integrity it used to be, despite the continued outstanding work of its individual scientists. It is tainted with the ‘new-Left’ politics of climate alarmism and all the appalling prostitution of science that goes with it. Hansen is safe as long as this travesty continues, and he knows it. And America has just voted for another four years of it. It’s just wrong for a climate scientist to speak out about the effect of digging up oil sands on climate. They should keep quiet and stick to writing papers. It won’t hurt for a few years in any case, even if what he says is true. By then we’ll have figured out how to get the CO2 back out of the air. Although I agree that scientists shouldn’t communicate with the public on their science findings (not about climate science anyway, maybe it’s okay in some areas), I’m not sure that when they do it can be classed as “electioneering”. “Electioneering” would be touting votes for a particular candidate or party, wouldn’t it? Even saying that “The public must demand that the government begin serving the public’s interest, not the fossil fuel industry’s interest” isn’t ‘electioneering. So I think David Middleton is misguided there. Do I know you Jimbo? The warmunists were seeing red (pun intended) when the Oregon Institute of Science and Medicine ran their Global Warming Petition because the cover letter looked similar to National Academy of Sciences publications, but it’s no problemo when their guy preaches from the steps of the Goddard Institute. Well said, your description of the oil sands project. It is without doubt the largest cleanup in history and one day people will be able to farm there. What really bothers the greens is that there is just so much oil so easily accessible. If only they could find a way to blame humans for the original spill! A few weeks ago I posted a short rhyme about James Hansen and ever since have been beating myself up for writing something so trite about such an “epic” person. I have felt compelled to replace that poem with a poem of a more epic grade of trite. AH!!!!!!!! Good socialist heads — please please change it for me !!! Certain political activities should also be analyzed under the Standards of Ethical Conduct for Employees of the Executive Branch. For example, campaign activities trigger the teaching, speaking, and writing restrictions of 5 C.F.R. § 2635.807. An employee may not use his official Government title or position to identify himself in connection with a speaking activity, unless the title or position is one of many biographical details. It really doesn’t matter what rules or regulations Hansen is violating – NASA has said (in so many words) that they are just going to look the other way. NASA GSFC in Maryland is responsible for the controversial NASA GISS – take your complaints to them and see what they say. Does anyone know how GISS heats their buildings in expen$ive downtown NYC? Do they use solar panels, wind turbines, and switchgrass?? Did you know that Hansen makes many hundreds of thousands more than his pay by accepting awards? The number is now over a million…. Hansen is to GISS as the Wizard is to Oz. Why would we spend billions removing a beneficial trace gas from the air? If some people think it’s worth it, maybe it could be arranged on a donation basis. He seems to have a case ethical Hansen’s disease. The disease seems to be quite contagious. It seems to be quite prevalent in the Washington D.C. area. My latest theory is that it is somehow transmitted by the handling of money.